The Google search engine seems to be the single most defining factor in accessing information available on the Internet – in this regard Hungary is no different from other parts of the world. In my opinion it has two main consequences for this research. Firstly, this kind of research – and any research that investigates the representation of a certain topic, and data connected to that topic on the Internet – necessarily should deal with the phenomena called Search Engine Optimization (SEO).1 Although the present paper does not discuss this aspect, partly because my knowledge about the field is quite limited, I am aware that the lack of this aspect could affect immensely the relevance of the data presented here. Secondly, even if my knowledge about the working mechanisms of search engines is limited, it seemed necessary to investigate what and how Google “think” about history in general and about certain historical topics in particular. To see “what and how Google think” I explore the search results produced by Google in connection with the chosen search terms. The first item of the search’s result is a ‘lap.hu’ [page.hu] site that Hungarian web-users are quite familiar with. Most of the searches about general terms like ‘history’, ‘biology’, ‘mathematics’, etc. leads to the Hungarian link inventory page www.startlap.hu. This page is operated by Sanoma Media Budapest Inc., the Hungarian branch of the European media conglomerate Sanoma Co., and one of the biggest private media company in Hungary. Startlap.hu administers around 9000 thematic pages (like tortenelem.lap.hu, biologia.lap.hu, matematika.lap.hu, etc.) and – for the average Hungarian user – functions as a secondary Internet filter after Google. This phenomenon is similar to the thematic catalogue of libraries and helps those who really do not know where to start the search about a certain topic. However, since with the help of Google it is possible to search any particular term, these inventories not necessarily channel users who conduct searches about more specific terms than ‘history’. I have found another Hungarian link inventory page (linkma.hu) that maintains a collection dedicated to history topics (tortenelem.linkma.hu) as well. This page is a community project, anyone can participate as editor of link collections as far as (s)he regularly up-dates the link collections (s)he is responsible for.4 Participation means to be the “host” of a certain collection of links: the host collects and updates the links that (s)he is responsible for. Through the selection of links the hosts can express their opinion and preferences concerning a certain topic but there are no options for posting comments or expressing personal opinions at this page. This is simply another Internet catalogue maintained by participating users. Unfortunately the history related collection of linkma.hu turns out to be an altogether poorly maintained collection of often dead or misleading links. However, I suppose it would be unwise to jump to conclusions about pages/collections maintained by collective efforts based on the case of linkma.hu. Many history related search terms lead users to the Hungarian version of Wikipedia. As far as I can judge the Hungarian version is quite well developed considering that the Hungarian speaking community is not particularly big. The History Portal of the Hungarian Wikipedia5 is a collection of sub-portals of historical topics. The following themes have their own sub-portals: ancient history, ancient Rome, Middle Ages, the French revolution, Napoleon, the 1948-49 revolution, WWI, WWII, the Cold War, heraldry, numismatics. In order to develop, up-date and maintain historical pages of the Hungarian Wikipedia a workshop/workgroup had been organized. The Hungarian History Workshop organize itself and distribute tasks on-line at the following page: http://hu.wikipedia.org/wiki/Wikipédia:Magyar_történelmi_műhely. It seems that considerable amount of work and care has been invested in the development of these pages. Based on my research I have the strong impression that the most popular history portal in Hungary is www.mult-kor.hu [past-time.hu]. Many history related Google searches lead users to this portal. It has the highest number of followers on Facebook, it covers a huge amount of topics, and it uses media synergies very well. Mult-kor.hu is operated by a public foundation that applies for state support in order to maintain its activities. The members of the board of the foundation, the contributing editors, and authors of the portal are well known historians, journalists and television reporters. Múlt-kor also exists as a television programme (30-minutes weekly magazine on the main public TV-channel) and publish a printed quarterly history magazine as well. Múlt-kor has been operating on-line and publishing its journal since 2000. The portal often choses topics that have some connections to actual events. For example this summer they have produced a collection of articles about the history of the Olympic games6. They also produced a collection about the phenomenon of economic crisis and its presence in different historical periods. They often treat popular topics from historical perspectives such as beer, legends and myths, but regularly present serious questions as the climate problem, war crimes, the Chernobyl catastrophe, and the 1956 revolution in Hungary as well. Among the topics and thematic collections there are many that concentrate on a problem that currently is the focus of interest in public discussions and the articles intend to shed light on the historical context of these issues. For example collections of articles can be found at mult-kor.hu about the following topics: the history of Romani people, rival national historical narratives in Hungary vs. Romania, the common history of Hungarians and Slovaks represented in Hungarian and Slovakian history books. Another popular history portal is www.huszadikszazad.hu [twentiethcentury.hu]. The project is interesting from the point of view of the present research since it is, in a way, about the re-building and reinventing of the past with the help of archive material. The project was initiated by history teachers. Currently it contains 26 000 articles, 37 000 pictures, and has 4000 registered users. It was elected “The Cultural Webpage of the Year” in 2010. The concept is the following: the webpage recollects and publishes archive articles from old newspapers. The page starts with 1st of January, 1900 and the editors collect clippings from the newspapers and journals of that period those were printed/published on a certain day. Users can click on any day of the last century and read a collection of texts that was published on that day in the Hungarian press. The project intends to be an Internet based newspaper that uses the press of the 20th century as its raw material. With the help of the selected material the page try to represent all political tendencies present in the newspapers of those days, and evoke the most important events of Hungary, Europe and the world. The press clippings are arranged by topic to the following categories: politics, economy, culture, science, sport, yellow press. The page is continuously developed, at the moment it contains daily collections from 1900 till 1946. There are 16 bloggers who regularly comment on the articles and it is open for users to comment on their posts. There are also several well known persons (television commentators, historians) who also have their own section where they comment the articles and clippings. In forums and comments users do not seem to be very active. Although, there is a section called “Private 20th century” where anyone can upload pictures from their private collection and share their private experiences and memories of the century. This section seems to be quite popular among users. Based on web statistics the most popular topic at this page among users is the material connected to the history of the Trianon peace treaty (I will come back to this topic later) and its consequences. But we should not jump to conclusions based on this, since the time period that is present on the page at the moment is dominated by this topic anyway. One of the interesting features of the Hungarian language blogosphere is that military and police history seems to be a topic that many serious bloggers are interested in. The best example is http://lemil.blog.hu. It seems to be a community of people seriously interested in the topic. There are about 20 bloggers who contribute posts to this blog more or less regularly many of whom have their own separate military history themed blogs. At lemil.blog.hu there are many posts that have more than 100 comments, it seems that readers are actually participating in the discussion. This is a very rare phenomenon compared to the activities present on other history sites. “The Great War Blog”9 is about WWI and can be categorized as a blog on military history. The founders of the blog are historians (specializing in military history), librarians, archivists and researchers. Their aim is to treat the events of WWI mainly from the Hungarian point of view, but they hope that with the help of new contributors joining their blogging community the scope of the blog can be widened. The blog is operated by a public foundation and was started in 2010. They have published diaries written by soldiers while at the theatre of war, posts about the everyday life during the war, reports about the research concerning actual battlefields, and collected personal stories and memories left behind by participants of WWI. The posts and documents are illustrated by maps and copies of original documents. There are only a limited amount of comments on the page (5 to 10 comments per post), and the blog has 900 followers on Facebook. One of the most popular general history blogs is “History for Everyone”10. Their slogan is “History not only for historians. Everything about history in popular, blog-like style.” The blog was started in 2008, it is updated regularly and has accumulated a quite rich collection of posts as of today. There are 5 resident bloggers who post regularly with the help of several guest bloggers. The topical sections that have the most articles are the following: 1. military history, 2. cultural history, 3. the history of the Balkans, 4. Hungary. But there are a collection of articles about the history of Central-Europe, the Mediterranean region, and the Middle East as well. One of the most discussed articles on the blog is about the Spanish Civil War – readers have appreciated the balanced point of view presented in the article. The posts usually have 5 to 20 comments, but there are surprisingly popular topics that attract many comments  for example the story about the charge of the Light Brigade in the Crimean War attracted more than 70 comments and a relevant discussion seemed to form around the topic. 1. The history of family names (95 comments). 2. A legend from the medieval ages about a possible ancient Hungarian capital city. 3. A review article about the Hungarian version of the on-line history game: Medieval II Total War. 4. A post about famous, several hundred year old trees in Hungary. 5. The origin of the Romanians – 69 comments follow the post where readers and bloggers discuss the history of language and nation. Romania is always interesting for Hungarians, mainly because of our turbulent common history. This discussion is interesting because it is not nationalist in tone, the commenters are discussing scientific facts about the Romanian language, and comparing works of different historians on the topic. Finally, I would like to mention a blog that is quite popular and one of my personal favourite. It is called “Falanszter [Phalansteres] – Centuries of Building and Destruction”.11 The blog discusses architecture and its connection with history, politics and ideology: investigates how the different political regimes since the beginning of the 20th century tried to shape the space around us. It is about the history of architecture and the history of ideology at the same time. The blog is full of interesting pictures of finished and unfinished architectural projects from the last hundred years. The posts try to discover and present objective facts about these past and often forgotten projects. The most popular posts have 70 to 150 comments, and the blog has 3200 followers on Facebook. This perspective  history seen from the point of view of architecture – is quite unique and seems to be popular among web users. In the following section I would like to mention some of the portals that represent “alternative” visions compared to the mainstream history concepts that are present at most of the above mentioned sites and portals operated mainly by professional historians, history teachers and archivists. The following sites represent (extreme) right wing opinions. Their interest in history is very selective. There are key questions these sites have an interest in, other topics are completely ignored. For example the “National Portal for Hungarians”12 is interested in – according to their mission statement  “national politics, ancient history of Hungarians and spirituality”. The site represent the pan-Turanist ideology, the idea that there is a natural historical bond that ties Hungary not to Christian Europe, but to the pagan Asian tribes the Hungarian tribes used to live together with before they conquered the land of Hungary. The historical questions the editors of the site are concentrate on are the following: history of Turanian nations, the Benes decrees (this dercree dealt with the status of ethnic Hungarians in post-war Czechoslovakia and laid the ground for the forced deportation of approximately three million Germans and Hungarians from lands held by their ancestors for centuries), the era of Miklós Horthy (the period between the two World Wars), Ferenc Szálasi (leader of the Hungarian Nazi party in the 1930s). The site represents the very strange mixture of Christian and pagan/mythical concepts about the origin of the Hungarian nation. 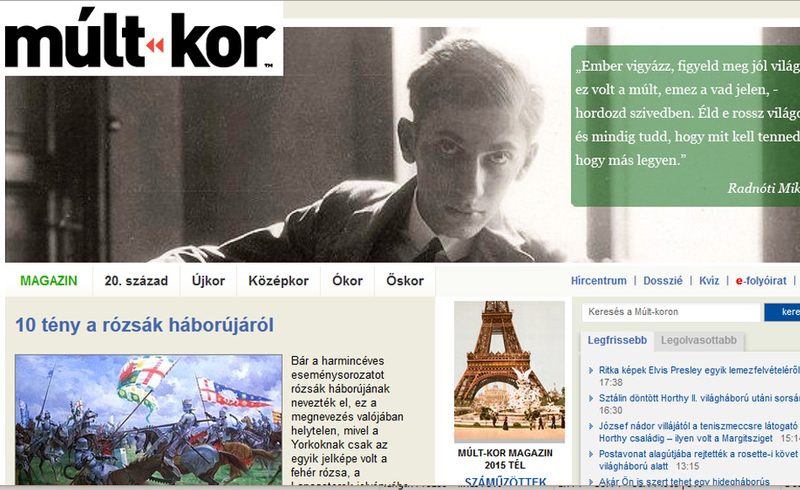 One of the most controversial webpages of Hungary is www.kuruc.info. This page openly supports Nazi ideology. Considering history kuruc.info is interested in the traditional extreme right wing favourites: Jews and gypsies. The page have a rich collection on Holocaust denial13. Their other favourite topic is the question of informants and secret agents during socialist times.14 Not being solved and discussed openly in public and political debates the issue of socialist secret agents is unfortunately pushed aside and to these extremist sites. This is one of the great deficiencies of post-communist Hungarian history/politics. A problem that not even the Internet could solve. It is rather unfortunate that, instead of open public discussions, such an important historic question is pushed to these kind of sites. This page represents the tendency of nationalist sites: they are interested mainly in ancient Hungarian history – the historical origin of the nation, anti-communism often means to them the return to the traditional law of the Hungarian tribes that invaded the region of the Carpathian Mountains in the 10th century and founded Hungary. One of the most important recent historical trauma from this nationalist point of view is the Trianon peace treaty (1920) that redefined the borders of Hungary (the country lost 72% of its pre-war territory). Henceforth these webpages when dealing with history focus on ancient Hungarian history and the crimes, such as the Trianon Treaty, committed against Hungarians. For the authors of these sites Europe represents an empire of invaders and alien emperors, and they consider Turanian people as natural allies of Hungarians. However, it is hard to generalize about this nationalists groups because there is a considerable difference between the pan-Turanist ideology represented by this webpage and other right wing concepts that consider Christianity and the Catholic state as the founding principles of Hungarian statehood, and consequently they are a bit less anti-Europe. But often these two ideas are mixed together in a strange manner. I have used the Google search “method” to investigate what is to be found at the Internet concerning several historical topics. I tried to explore what kind of information is available, how balanced are the views expressed at those pages that have the highest rank on Google’s search result when using such search terms as “Holocaust”. There are several entries in the Hungarian Wikipedia about the Holocaust. The two main entry being “Holocaust”18 and “Jewish Holocaust in Hungary”19. The above mentioned popular history portal Mult-kor.hu also have several articles about the Holocaust20. The page “Holocaust in Hungary”21 contains digital course material for students and teachers about the Holocaust. The page of the National Committee for Attending Deportees22 maintains a huge database of testimonies of Holocaust survivors that was collected right after WWII by the National Committee of Welfare of Deported Persons. The Budapest Holocaust Museum and Educational Centre also publishes information and educational materials about the Holocaust on its webpage23. The Museum of Terror also maintains a webpage dedicated to the topic24 that includes an introductory article, a detailed chronology of the events of the deportations in Hungary, a photo gallery and a bibliography of the topic. And finally the above mentioned extreme nationalist site, kuruc.info has its collection of materials about Holocaust denial25. It can be concluded that a wide range of information is available at these sites about the Holocaust. The first two entries contain very detailed information based on historical research and documents. The view represented here seems to be considerably balanced: for example the Wikipedia entry discusses in detail the negative role played by Hungarian authorities and Hungarian civilians in the “Endlösung”. By studying these two pages one can acquire a balanced basic knowledge about the topic. And it is quite obvious from the list of results that the believers of Holocaust denial busily spread their views as well. At most of these pages there is no comment function. Where it would be possible to comment on an article (for example the articles at www.mult-kor.hu) there are no comments at all. (The page uses the ‘comment through Facebook profile’, that usually filters more effectively those extremist commenters.) It is only the YouTube documentary that has an open discussion function. The believers of Holocaust denial posting their usual conspiracy theories while relatives of Holocaust victims use their personal examples as the proof of past events. In general, I would say that each and every kind of information is available, it depends on users how can they use and interpret it. Hungarians at the moment live in a politically turbulent time. The governing party that has a two-third majority in parliament uses its unprecedented political power to redefine democratic standards. Many of the contemporary political debates are rooted deeply in historical questions since the governing party actively participates in the re-invention and re-interpretation of Hungarian history.26 The current redefinition of the relationship of Hungary to Europe is part of this process. The key concepts are independence and the emphasis on the natural historical relationship between Hungarians and Asian nations. One of the important history related contemporary debate was over the new Hungarian Constitution. The Constitution was ratified by the governing party in 2011 with no support from any other parties. The whole problem has many historical connections. The debate on the Constitution is a debate about the identity of the Hungarian nation, and about the conceptualization of historical continuity and discontinuity. It is also connected to the (re)definition of the roles played by conservative and leftist thinking in our history. The historical concept expressed by the new Constitution is the symptom of the re-invention of Hungary as a right wing, conservative and religious country. In this process there are topics that are more important than others, the canon of important historical figures and significant historical periods are being redefined. The setting of the new agenda is present in each form of the Hungarian media. The two main questions are the origins of the nation (the founding principles of Hungarian statehood: Christianization of the nation by the first king of Hungary vs. the pagan traditions of the Hungarian tribes), and the tradition of the right wing, Christian Hungary (this tradition is exemplified by the era between 1919 and 1944, the so called “Horthy-era”, that followed the period of the proletariat’s dictatorship in 1919). The topic of the founding principles of Hungarian statehood dominates the above mentioned extremist websites and portals. Although, the situation is quite confusing, because the two seemingly opposite views of Christian Hungary and the Hungary represented by pagan tribes from Asia are mixed up in, some times, surrealistic manner. Meanwhile these contradictions are clear for the “neutral” reader of these sites, there are no considerable public discussion about these topics, partly because these ideas based on faith and can not be contested by rational arguments. The other key issue, the Horthy-era, can be represented through two concepts: the question of the Trianon Peace Treaty, and the political leader of the era, Miklós Horthy (Regent of the Kingdom of Hungary between 1920 and 1944). I would say that for a young user of the internet who would be interested in questions that dominate contemporary political rallies and news programmes in Hungary, the search terms “Trianon” and “Miklós Horthy” would be very important. So I will present shortly the result of Google search concerning these two terms. Based on these resources the user can establish a basic knowledge of the historical facts about Trianon, and can also detect the rightist sentiments surrounding the issue. But this way users will not find any open discussion about the topic, the different opinions are present on different sites. This is not surprising, it is the dominant trend in contemporary Hungarian politics and public affairs that there is no communication between different point of views and opinions. This aspect of Internet practices mirror our society faithfully. 1. The Wikipedia entry about Horthy34 – the page seems to be an ideologically neutral account of the facts and views about the life of and role played by Horthy. Different opinions are presented and the historical resources and the works by historians are used as references. 3. Who is who? Miklós Horthy35 – a short biography and list of recommended books about Horthy. This short biography slightly tends toward a positive representation of the political role played by Horthy (that is the current, new trend). 5. An interview with a historian specialising in the Horthy-era published on the webpage of the right wing daily newspaper Magyar Nemzet37 – This historian is a PhD candidate whose research concentrates on trends in evaluating the Horthy era since the fall of communism and how political parties using the figure of Horthy in their identity politics. He runs a blog (The Myth of Horthy Today38) about the topic. He posts 1 to 3 short entries per week since 2010 and represents a moderate scientific standpoint, and so do his readers and commenters. Those who are really interested in the Horthy phenomenon would find this blog a very useful and objective resource. In general it could be said that the Wikipedia entry and the “Myth of Horthy Today” blog provide proper basic information about the whole phenomenon. Interested users can gather the wide spectrum of pro and contra opinions on the issue. But, again, besides the neutral, research based sites that present facts and balanced views, other sites tend to represent uncritical, right wing opinions. And again, there is no discussion or debate between different point of views. Concluding my observations I have to admit that the views and conclusions I presented above are partial in many aspects. It is obvious that without an internet specific research method these observations always remain accidental, and it is impossible to generalize the results of these observations. Henceforth my concluding remarks are no more that vague impressions about certain features of the presence of history on the Hungarian language web. I have the impression that usually a wide range of information is available to users in Hungarian about many historical topics. With a little bit of search material supporting any point of view and its complete opposite also can be found. It depends on users how they use and interpret the information they have found. Most of the Google searches about history topics would lead users to the Hungarian Wikipedia where – as far as I have experienced so far – the entries about history are reasonably competent. The aim of the community maintaining these pages is clearly to represent wide variety of views about each topic and include information that can be verified on the basis of up-to-date historical research. The general interest history portals and blogs try to cover the widest possible range of topics. Although, Hungarian history usually dominates these pages, the material about other parts of the word also significant. Most of these pages are maintained by professionals – historians, teachers, archivists – and represent standard quality. It is also clear that the Internet is a place for alternative and, often, extremist views. With a bit of a search a huge amount of material can be found on Holocaust denial, anti-Semitic sentiments, etc., but the opposite views are also present and can be found just as easily. In general, most of the pages and blogs lack significant discussions or debates. Hungarian users tends to be quite passive when they have to present their rational arguments, but they seems to be rather active in stating their sentiments and beliefs. 3 Among the proposed thematic groups one can find the common categories concerning history: periods (prehistory, ancient history, Roman Empire, middle ages, modern history), Hungarian history, military history, significant personalities, history of religion, history of technology, history of writing, etc. 4 The opening page of tortenelem.linkma.hu sets up eleven categories and sorts history related links according to them. The categories are the following: history of England, history of USA, history of Europe, military history, history education, history books, Hungarian history, world history, periods, historians, history journals. But before we get too exited about the section “history of Europe” it turns out that half of the, altogether 7 links are dead. 7 The methodology of using properly these statistics about clicks and labels that sometimes present on pages needs further research. It is certain that these features should be core elements of understanding how the web in general and webpages in particular function when we speak about the representation of cultural information on the Internet. 8 Or maybe there are many other very good blogs that are completely invisible because not supported by the crosslinking possibilities provided by index.hu to their best blogs? 17 Considering user activity it seems to be a general tendency that the believers of extremist views are more actively – and some times more aggressively – express their attachment to the views they believe in. Concerning this I find interesting the statistics of the Facebook followers of Hungarian news sites that represent different ideological views. The above mentioned Kuruc.info has 49 000 followers on Facebook, nol.hu (leading leftish-liberal daily newspaper’s website) has 14000 followers, mno.hu (leading right wing daily newspaper’s website) has 5800 followers. 26 In Hungary contemporary politics, in a way, always was and will be the battle between political forces that are convinced that they are entitled to decide which (hi)story is “the” proper history of the nation.